To help users or other concerned parties keep track of important changes or events, you can configure sending automatic email notifications. Notification rules define when to send an email to a recipient. For example, you may want an administrator to receive notifications when a user sends them a request, notify users when a new activity is assigned to them, or inform a concerned party each time customer details are edited. In the main menu, navigate to System > Emails > Notification Rules. On the notification rules list page, click the Create Notification Rules button in the upper-right corner of the page. Define what triggers an email notification and the template used. See the General section of this guide. Define email notification recipients. See the Recipient List section of this guide. 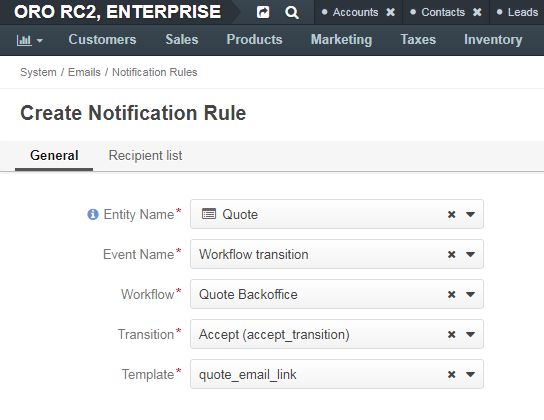 Select an entity related to the notification rule that you create. Entity create—An entity record has been created. Entity remove—An entity record has been removed. Entity update—An entity record has been edited. Workflow transition—Available only when the entity selected in Entity Name has related workflows. A workflow transition has been performed. Transition Available only when Workflow transition is selected for Event Name. Select the workflow transition upon which a notification email is sent. Template Select the template for which the rule will be created. The Recipient list section defines who to send an email notification to. Users—Specify users to send notifications to. Start entering a name of the user, and when suggestions appear, click one to select it. Click the x icon to remove a user from recipients. Groups—Select check boxes in front of the user groups whose members are to receive the notifications. Email—Enter the required email address. Owner—Select this check box to send notifications to the owner of the record for which the event takes place. Additional Associations—This is a list of entities with the email field, whose records can be linked to records of the entity selected for Event Name. Select check boxes in front of the required associations to send notification emails to their addresses. On the notification rule list, click the required notification rule. Review the notification rule details. For the description of the fields, see Detailed Notification Rule Information. 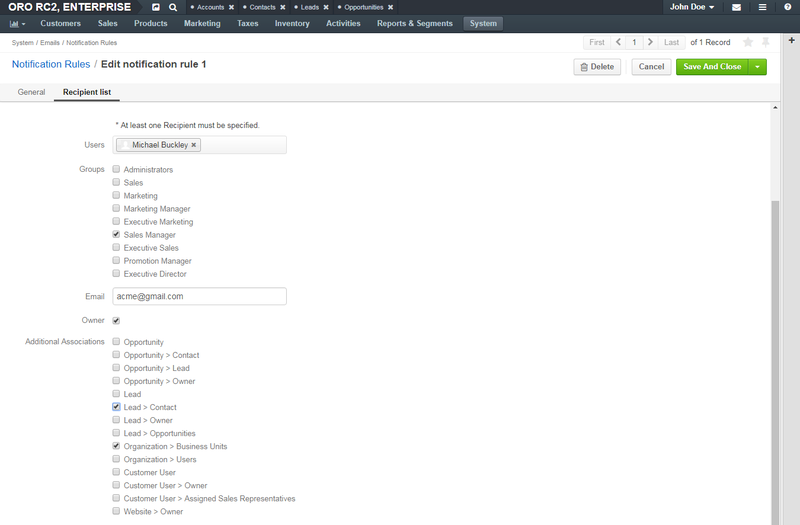 On the notification rule list, choose the required notification rule, click the More Options menu at the end of the corresponding row, and then click the Edit icon. Update the notification rule details as necessary. For the description of the fields, see Detailed Notification Rule Information. On the notification rule view page, click the Edit button in the upper-right corner of the page. On the notification rule list, choose the required notification rule, click the More Options menu at the end of the corresponding row, and then click the Delete icon. Alternatively, you can delete a notification rule from the notification rule view page by clicking the Delete button in the upper-right corner of the page. On the notification rule list, select check boxes in front of the notification rules that you would like to delete.